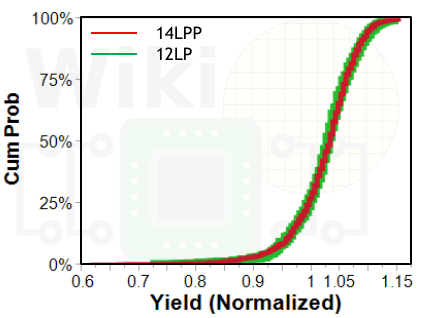 Compared to the 14LPP, the improved 12LP transistors achieved around 15% faster ring oscillator AC performance for identical IDDQ levels. 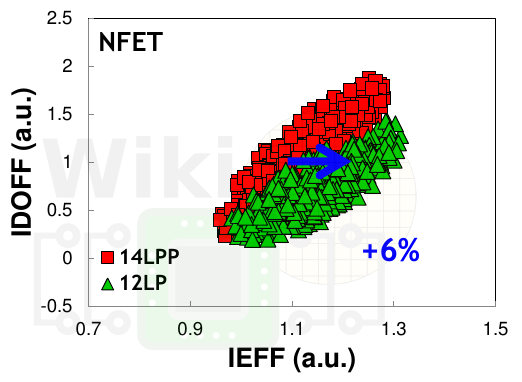 Likewise, compared to 14LPP, GlobalFoundries is reporting 6% and 22% higher DC performance for nFET and pFET respectively for identical IDOFF. 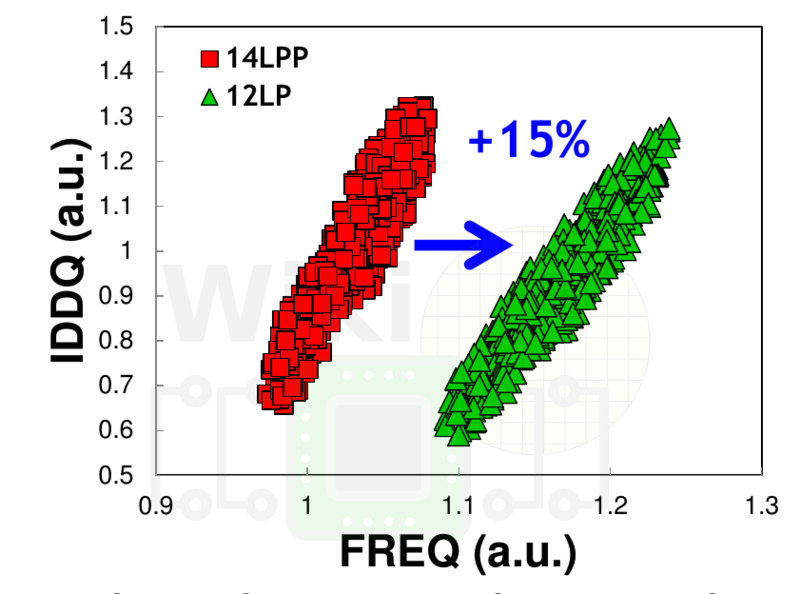 The device performance does not have any major impact on reliability and GlobalFoundries reported comparable or better reliability values over their 14LPP process. For the new seven and a half tracks library that was added in 12nm, GlobalFoundries is reporting a 16% reduction in the total power consumed for identical frequencies. 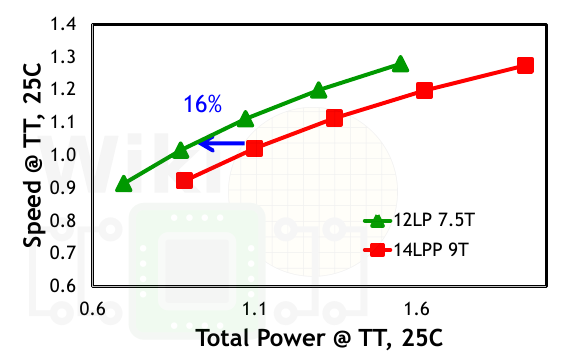 Note that this comparison is done against the 14nm 14LPP 9T high-performance cells. 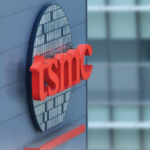 Although 12nm does not bring new SRAM cells, like everything else, they enjoy the benefits of the improved device performance. 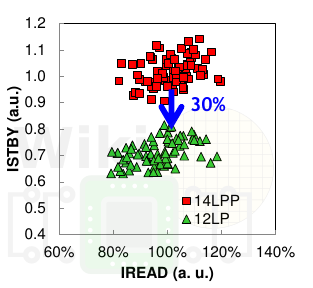 GlobalFoundries reported around a 30% reduction in leakage (Istby) for comparable Iread levels. 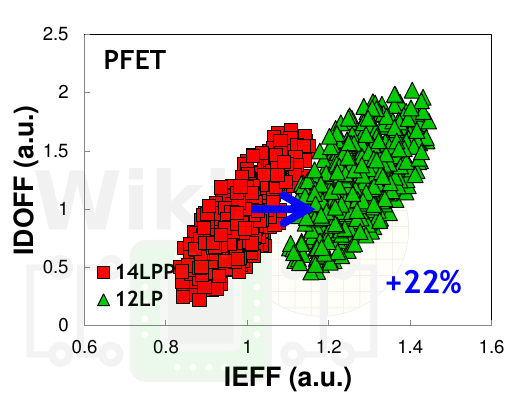 Likewise, 12LP SRAM FETs showed comparable Vt mismatch to 14LPP. 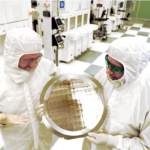 GlobalFoundries 12LP which ramped earlier this year was designed to make it as seamless as possible for their 14nm customers to migrate over to 12nm. 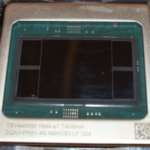 GF robust 14nm platform and IPs are largely compatible with 12nm. Unlike other foundries, GF made no optical shrinks or other major design rule changes that would force customers to make more significant design reworks. 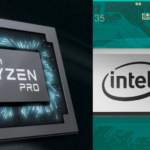 Instead, they opted for improving the device characteristics as well as introducing a new higher-density library that brings a modest density and performance improvement over the prior 14LPP high-performance library. Customers can also continue to use their existing 9T and 10.5T libraries while taking advantage of the higher performance from the raw device improvements that were made to 12LP. Overall, the low-risk, high reward strategy for 12LP has worked well and GlobalFoundries is reporting yield comparable to 14LPP with a number of customers, including AMD, already leveraging the process for mass production products. GlobalFoundries has also extended the platform to include new RF and analog applications as well as automotive-grade applications.